Mention the word ‘Komodo’, and dragons will probably be the first thing that springs to mind, but Komodo National Park and Marine Reserve is also an enticing hub for SCUBA divers in search of marine life, from large pelagic animals to tiny marine critters. Geographically Indonesia is at the meeting point of some of the world’s greatest seismic activity between the Eurasian-Australian continental plates and the Pacific-Philippine Sea oceanic plates. The waters here are subject to some of the strongest currents in the world as tidal changes are channeled between the Pacific Ocean and the Indian Ocean. As part of the so-called Coral Triangle, which supports three quarters of all known coral species, and several thousand species of coral reef fish, the highly nutritious water sustains some of the richest marine biodiversity on earth. In the Komodo Marine Park, the warmer Flores Sea converging with the cooler water of the Sumba Strait provides perfect conditions for growth of a rich planktonic soup, nourishing a vast variety of marine life, and it is this biodiversity that makes SCUBA diving one of the main focuses of tourism in the area. While there are plenty of sheltered dive sites for inexperienced divers, or those who just don’t like currents, most of the diving here requires a lot of experience and an Advanced Diver qualification, with more than 50 logged dives. With dive sites referred to as “Torpedo Alley”, ‘Shotgun” and “Rodeo Rock” the challenging topography and extreme currents promise some exhilarating diving. The unique Komodo dragons, found only on the Indonesian islands of Komodo, Rinca and Padar, have been declared a vulnerable species. The largest of the monitor lizard family, they can grow to over 3m in length and weigh more than 70kg. They have a fearsome reputation as hunters and killers, preying on wild buffalo, deer, goat and wild pigs, as well as making cannibalistic attacks on their own offspring, indeed newly hatched dragons spend their first few years of life hiding in trees in order to avoid being eaten by their parents. It had long been thought that animals bitten by Komodo dragons would succumb to bacterial infections of their wounds, but it now seems likely that dragon saliva contains venom and anticoagulants which eventually leads to the death of the victim. In order to protect the worlds largest lizard, Komodo and the surrounding islands Rinca and Padar were declared a national park in 1980. This was soon extended to include the surrounding marine area and part of Flores and in 1991 the National Park became a UNESCO World Heritage Site. Management of the park has encouraged Ecotourism; small scale, low impact, ecologically and socially responsible travel as a means both to educate visitors and raise sufficient funds to cover management and operational costs through entrance fees and tourism licenses. Locally however, there is still some controversy over park management from the local population who rely on fishing for their livelihood, and the illegal use of destructive fishing methods such as explosives and cyanide by local fishermen has damaged some areas of coral. Plastic debris and litter in the marine park is also a problem that needs to be addressed by the management strategy. We embarked the Indo Aggressor, a 37m, passenger yacht departing from Labuan Bajo on the island of Flores, our home for the next ten days as we explored the Park. If you’ve ever heard the expression ‘dive, eat, sleep, repeat’ that is what we did every day as we cruised around the islands in search of the best dive sites in the best conditions. Sightings of Mantas were high on everyone’s wish list and several of our dive sites were at locations where manta’s come regularly for feeding and cleaning. They are filter feeders, using the cephalic fins on the front of their head to channel water into their open mouth, sieving plankton from the water as they swim. In Indonesia, the majority of manta’s encountered are non migratory reef manatas; M.alfredi can reach 5.5m from wingtip to wingtip, but we were also lucky enough to meet one of the larger solitary oceanic species M.birostris which can have wingspans of 7m. Manta rays are both targeted by fishermen, and can also suffer injuries from fishing lines and nets as well as from boat propellers. As they take years to reach sexually maturity, an entire population can become threatened in a surprisingly short length of time. The Mantas were there from our first dive, circling around their chosen cleaning station, a retinue of butterfly fish nibbling away to remove dead skin or parasites. These enormous beasts swooped low over our heads completely disregarding our presence and allowing plenty of close up photography and video filming. We were lucky enough to find mantas on many of our dives, thanks to the detailed knowledge of the trip director and our skillful dive guides, but the first encounter with these beautiful beasts really set the scene for the whole trip. It wasn’t only the Manta’s that we were here to see, there were fish everywhere; enormous schools of yellow snappers, fusiliers and surgeon fish. Brightly coloured bannerfish, red toothed triggerfish, strikingly patterned clown triggerfish, nasty looking Titan triggerfish, midnight snappers, batfish, angelfish, lionfish to name but a few. In the open water giant trevally’s cruised by, along with barracuda, and the occasional shark. Mobula rays, blue spotted rays and eagle rays cruised the reef giving an impression of moving in slow motion, and one of the most remarkable things about all these fish was their size, all of them much larger than their counterparts elsewhere in the world. The corals were healthy, and the selection of critters impressive; nudibranchs and starfish of every colour, size and shape, mantis shrimps, harlequin shrimps, robust ghost pipefish, ornate ghost pipefish, pygmy seahorses, zebra crabs, tiny stuff to equal all the variety of the giants above. One dive brought the unexpected excitement of a pair of banded seasnakes weaving their waythrough the coral gardens. Green and hawksbill turtles were a common sight too, and inside almost any cavern you care to look in, juvenile nurse sharks and enormous lobsters. Scorpion fish, leaf scorpion fish, stonefish, Ambon scorpion fish and the rare rhinopia as well as the occasional frogfish were plentiful, although so perfectly camouflaged against the corals, not at all easy to spot. Night dives brought out even more interesting creatures, juvenile cuttlefish, squid, juvenile batfish, starry night octopus, giant molluscs emerged from their shells, while moray eels emerged from crevices to explore and crabs scuttled out from under rocks. It was an amazing expedition and we were looked after attentively by all the staff on board, from taking care of our equipment, to the luxurious accommodation and great food, the best kind of diving adventure you could ever ask for. Now, where can I see a sunfish? Posted in Photography, SCUBA, Sporty Stuff, Travel, WildlifeTagged Dragons, fantastic photos, fish, Indonesia, Komodo, Manta Ray, SCUBA, scuba diving, Travel, WildlifeBookmark the permalink. 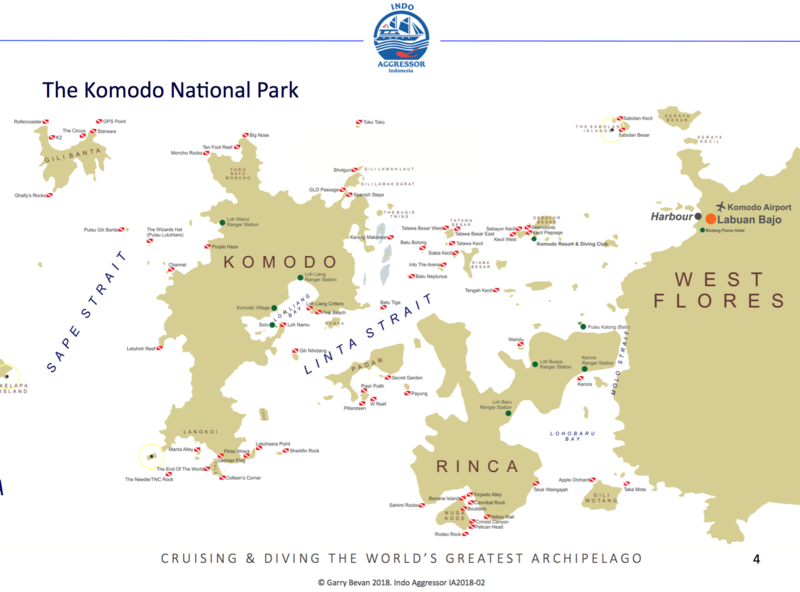 Zulfa and I just did a shorter trip through the Komodo National Park. I need to learn how to scuba dive. You shot some lovely photographs. Thanks Johan! I saw that you were in Komodo too, beautiful isn’t it?! You should definitely learn to scuba dive – cycling is great, but scuba is amazing! Take care!